"You're Not Dressed Up If Your Shoes Are Worn Down"
Imagine if you had to go through life barefoot. Sounds appealing, perhaps, until you begin to factor in hot pavement, rain, mud and all the other calamities our shoes go thru. Footwear protects your feet and are a reflection of the your personality. They define your personal style and say a lot about who you are. They are an important, yet often overlooked. part of your wardrobe. The most common mistake for men and the second-most common mistake for women is unkempt shoes. Luckily, you can help prolong the life of your shoes and boots with a little shoe S.M.A.R.T.S. (Shine, Maintain, And Repair Those Shoes). Leather is nature's perfect shoe material. Leather breathes which allows your feet breathe as nature intended. Leather flexes and bends with every move you make. Leather is luxurious and durable. Leather is restorable and is an investment that requires personal care. Leather may cost a little more but will last alot longer with proper care. No matter how we try to protect our footwear, shoes get wet. It is possible to minimize the effects of water, weather and avoid mold growth. Allow your shoes to partially dry at room temperature. While shoes are still damp, insert cedar shoe trees and continue to allow shoes to dry. Keep your footwear away from direct heat because prolonged exposure to heat may dry and crack leather. Ask a shoe repair professional to replace your worn down soles and heels. Extend the life of your shoes with protective soles. These are very thin rubber soles applied over the sole of the shoe to make it longer wearing. They are great for womens dress heels. Weatherproof shoes and boots to protect them from the elements. Don't let dirt build up, clean shoes and boots regularly. Maintain the leather luster: polish, polish, polish. Keep your shoe shape by loosening laces or buckles before removing. Don't suffer with tight shoes. Your shoe repair professional can stretch and adjust shoes for increased comfort. Bunions? Hammer toes? Corns? Shoe repair professionals can adapt shoes to fit unique feet. Help prevent or help with knee, hip and back problems by keeping shoe heels balanced. Use shoe trees between wearings to help shoes retain their shape. Use cedar shoe trees to keep shoes looking their best because cedar's unique wicking action absorbs moisture, acid and salt, which reducing cracking and deterioration of leather. Use a shoehorn for slipping your shoes onto your feet, this prevents breakdown of the heel counter, the leather support between the lining and the upper of the shoe, from losing its stability. Practice preventive maintenance. Repair your shoes before every-day wear turns into damage. When traveling, pack your footwear in flannel shoe bags. The flannel protects your fine leathers from scuffs and nicks. Keeping your shoes looking good is not hard to do. Shoe care is especially easy if you have the right stuff. 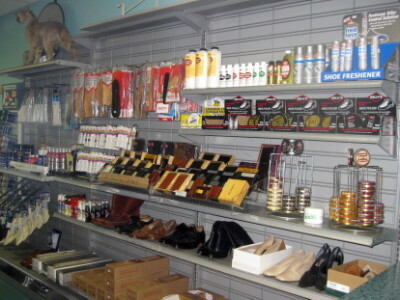 There are many products available for dress & casual shoes, boots, athletic shoes and suedes. Think of the shoes you need to spruce up, then check below for a few ideas. Cleaning is the removal of scuffs, excess dirt or mud, food, etc. from your shoes. All types of shoes can be cleaned, however there are different products designed to be used on different materials. Some cleaners are too harsh on some materials while others are not strong enough. Choosing the right cleaner makes all the difference in the task and results. Sneaker shampoo is much better for your athletic shoes than throwing them in the laundry which causes deteriation of the components of the shoe. Do not put them in the dryer, allow them to air dry. Using a nylon scrubber brush makes cleaning sneakers quick and easy. White liquid polish is excellent for re-whitening sneakers. Suede & Nubuck cleaners are specifically designed for these special materials. This along with a nylon or soft wire brush will bring new life to your shoes. Be gentle brushing nubuck. It is more delicate than suede and easily damaged. The key to keeping these materials in top shape is preventive maintenance. Before you wear the shoes, protect them with a water and stain repellant. Condition the leather to soften. Conditioning keeps shoes soft and supple and helps to provide a longer life to your shoes. Have you ever notice the cracking that takes place with leather shoes over time? Conditioning is a major factor in preventing these cracks which is caused by the drying out of the leather. A rule of thumb is to give your shoes a thorough conditioning atleast once a year, moreso on shoes/boots that are exposed to excessive heat and moisture. Using products for smooth leather on Exotic Reptile or Snake Skins may leave a residue that will build up around the base of the scales and cause them to crack or fall off. Weatherproof your shoes. Water and stains have proven to be major problems of most shoes, especially light colored and suedes. Repeated moisture soaking into the material of the shoe causes deteriation and spotting. There are many protector products available, primarily the most commonly used is in an aerosol spray, however, some shoes/boots would benefit more from a liquid form of water protectant.